NASA is working to resume science operations of the NASA/ESA Hubble Space Telescope after the spacecraft entered safe mode on Saturday 6 October, shortly after midnight CEST. Hubble’s instruments still are fully operational and are expected to produce excellent science for years to come. According to these tweets from Dr. Rachel Osten, Deputy Mission Head for the Hubble Space Telescope at the Space Telescope Science Institute, the Hubble Space Telescope is in Safe Mode. Am Weltraumteleskop „Hubble“ ist ein Kreiselstabilisator ausgefallen. Mit Hilfe der Instrumente orientiert sich das Gerät im All, doch nur noch zwei von sechs sind funktionsfähig. On Aug. 29, 2018 a small hole was discovered on the International Space Station. This resulted in a pressure leak. The hole has been identified and fixed by space station crew. Russian media recently reported that General Director Rogozin said the hole was not a manufacturing defect. Ruling out a manufacturing defect indicates that this is an isolated issue which does not categorically affect future production. Das Leck in der Internationalen Raumstation ISS, das seit Ende August Rätsel aufgibt, wird jetzt auch kriminalistisch untersucht. Die Luftfilter aus dem betroffenen Raumschiff Sojus MS-09, die am vergangenen Donnerstag zur Erde zurückgebracht wurden, sind jetzt den Rechtsschutzorganen übergeben worden, meldet die Nachrichtenagentur RIA Nowosti unter Berufung auf eine nicht näher benannte Quelle. BepiColombo is scheduled for launch at 01:45 GMT (03:45 CEST) on 20 October on an Ariane 5 from Europe’s Spaceport in Kourou. Final assembly of the two orbiters and transfer module has taken place, ready for the spacecraft to be integrated into its Ariane 5 launcher. Der Start der Merkur-Mission BepiColombo an Bord einer Ariane-5-Trägerrakete von Europas Raumflughafen Kourou in Französisch-Guayana aus ist am 20. Oktober 2018 um 3.45 MESZ geplant. Vertreter traditioneller sowie sozialer Medien sind eingeladen, sich anzumelden, um den Start vom Missionskontrollzentrum der ESA in Darmstadt aus live mitzuverfolgen. A European astronaut has taken command of the International Space Station for the second time since 2009. Alexander Gerst of ESA (European Space Agency) accepted control of the orbital lab today from NASA astronaut and Expedition 56 Commander Drew Feustel. Only three people inhabit space right now. ESA astronaut Alexander Gerst makes his debut as commander of the International Space Station with a reduced crew, following the departure of Expedition 56 astronauts Drew Feustel, Ricky Arnold and Oleg Artemyev. Watch live commentary and news briefings as NASA lands a spacecraft on Mars! 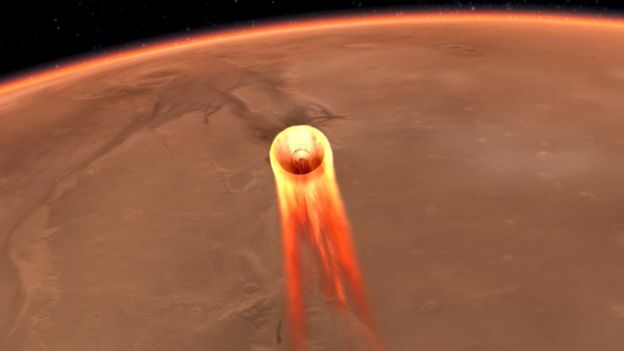 The InSight mission is designed to study the deep interior of Mars for the first time, providing a new window into the evolution of rocky planets, including Earth. Growing up, NASA-JPL engineer didn’t have a role model who was an engineer and a women of color. Bow, she hopes she can play that role for the next generation as Mars Cube One (MarCO) – a pair of experimental CubeSats – attempt to get to Mars and help the InSight lander to communicate with Earth. Nach 196 Tagen im All sind drei Astronauten am Donnerstag von der Internationalen Raumstation ISS sicher auf die Erde zurückgekehrt. Two U.S. astronauts and a Russian cosmonaut kicked off World Space Week on Thursday (Oct. 4) by returning home from a six-month stay on the International Space Station. At 1:06 a.m. EDT, the hatches were closed between the Soyuz spacecraft and the International Space Station in preparation for undocking. Expedition 56 Commander Drew Feustel and Flight Engineer Ricky Arnold of NASA, along with Flight Engineer and Soyuz Commander Oleg Artemyev of the Russian space agency Roscosmos, are scheduled to undock their Soyuz at 3:57 a.m.
Expedition 56 Commander Drew Feustel and Flight Engineer Ricky Arnold of NASA, along with Flight Engineer and Soyuz Commander Oleg Artemyev of the Russian space agency Roscosmos undocked from the International Space Station at 3:57 a.m. EDT to begin their trip home. NASA’s partners in the International Space Station are showing a growing interest in extending the station’s operations beyond 2024 regardless of NASA initiatives to end direct funding of the station around that time. Space-elevator tech, a longtime sci-fi staple, is about to get a test here in the real world. The Japanese STARS-Me (Space Tethered Autonomous Robotic Satellite-Mini Elevator) payload arrived at the International Space Station (ISS) on Sept. 27, aboard Japan’s robotic HTV-7 cargo spacecraft. The experiment was produced by researchers at Shizuoka University in Japan, in collaboration with Obayashi, a Japanese construction firm. Ende August wurde auf der Internationalen Raumstation ISS das hyperspektrale Erdbeobachtungsinstrument DESIS montiert. Nun wurde es erfolgreich in Betrieb genommen und hat erste Aufnahmen geliefert, die in der vergangenen Woche präsentiert wurden. Von der Datenqualität sind die beteiligten Teams vollauf begeistert. Relief workers can now use freely available satellite imagery to navigate destruction from the recent earthquake and tsunami in Indonesia. The laser instrument that launched into orbit last month aboard NASA’s Ice, Cloud and land Elevation Satellite-2 (ICESat-2) fired for the first time Sept. 30. With each of its 10,000 pulses per second, the instrument is sending 300 trillion green photons of light to the ground and measuring the travel time of the few that return: the method behind ICESat-2’s mission to monitor Earth’s changing ice. By the morning of Oct. 3, the satellite returned its first height measurements across the Antarctic ice sheet. NASA and the National Oceanic and Atmospheric Administration (NOAA) have appointed a board to investigate an instrument anomaly aboard the Geostationary Operational Environmental Satellite (GOES) 17 weather satellite currently in orbit. During postlaunch testing of the satellite’s Advanced Baseline Imager (ABI) instrument, it was discovered that the instrument’s infrared detectors cannot be maintained at their required operating temperatures under certain seasonal and orbital conditions, resulting in a loss of approximately three percent of the instrument’s availability over the course of a year. This loss exceeds a key design requirement. Engineers at NASA’s Jet Propulsion Laboratory in Pasadena, California, this week commanded the agency’s Curiosity rover to switch to its second computer. The switch will enable engineers to do a detailed diagnosis of a technical issue that has prevented the rover’s active computer from storing science and some key engineering data since Sept. 15. Der NASA-Rover Curiosity hat zwei Hauptcomputer an Bord. Wegen eines Speicherfehlers hat er den aktiven nun gewechselt. Das ist nicht das erste Mal. As engineers scramble to fix a glitch in the Curiosity rover on Mars, they have switched the rover from its misbehaving computer to a second, backup brain, according to a statement released by NASA yesterday (Oct. 3). The MASCOT asteroid lander lived fast and died young, as planned. The shoebox-size, hopping robot, which touched down on the 3,000-foot-wide (900 meters) asteroid Ryugu Tuesday night (Oct. 2), has given up the ghost, mission team members announced this morning (Oct. 4). Eine deutsch-französische Sonde ist auf dem Asteroiden Ryugu herumgehüpft, hat Bilder geschossen und Messdaten gesendet und jetzt seine Arbeit eingestellt. A NASA sun-studying spacecraft’s first Venus flyby is in the books. The agency’s Parker Solar Probe zoomed within 1,500 miles (2,400 kilometers) of Venus as planned this morning (Oct. 3), getting an orbit-sculpting gravity assist, NASA officials said. Auf die ISS könnte eine Raumstation im Mondorbit folgen. Ideen wurden in Bremen ausgetauscht. Aber auch andere Monde rücken in den Fokus. To distant, Earthling eyes, the gap between Saturn and its rings looks calm, like a deep breath of empty space between one beautifully intricate structure and another. But in 11 new papers, born from the demise of one of NASA’s most beloved planetary science missions, scientists destroy that illusion, laying out a set of unexpectedly complicated phenomena dancing through that emptiness. Die Raumsonde „Rosetta“ funkte spektakuläre Fotos von der Oberfläche des Kometen „Tschuri“ zur Erde. Nun hat ein Hobby-Forscher eines aufbereitet. On Oct. 3, 2018, Parker Solar Probe performed the first significant celestial maneuver of its seven-year mission. As the orbits of the spacecraft and Venus converged toward the same point, Parker Solar Probe slipped in front of the planet, allowing Venus‘ gravity — relatively small by celestial standards — to twist its path and change its speed. NASA’s New Horizons spacecraft successfully completed a brief engine burn on Oct. 3, the first maneuver in which it was able to rely on actual photographs it had already taken of its eventual target. Want to get away? Want to get far, far away? Voyager 2 has you beat: The spacecraft, launched in 1977, is approaching the edge of the solar system, according to a NASA statement released today (Oct. 5). NASA’s OSIRIS-REx (Origins, Spectral Interpretation, Resource Identification, Security-Regolith Explorer) mission executed the first asteroid approach maneuver that day, putting the spacecraft on track for its arrival at asteroid Bennu in December, NASA said in a statement. In der letzten Phase der Cassini-Mission hatten Wissenschaftler die Gelegenheit, ein ganz besonderes Phänomen rund um den Ringplaneten Saturn zu untersuchen: den sogenannten Ringregen. Es handelt sich dabei um Partikel aus den Ringen, die in die Atmosphäre des Gasriesen gelangen. Analysen zeigten, dass diese Teilchen Wassereis und Silikate enthalten. Exploring the tropics of Jupiter’s ocean moon Europa would be no walk on the beach. Equatorial regions of the potentially life-supporting Europa, which harbors a huge ocean of salty liquid water beneath its icy shell, are probably studded with blades of ice up to 50 feet (15 meters) tall, a new study suggests. Imagine Earth’s north pole drifting as far south as Ireland — that is about how much the crust of the dwarf planet Ceres has wandered over the rest of that miniature world over time, a new study finds. Hubble – Exomoon / Mond um Planet Kepler-1625b? Hubble: Ein Riesenmond um Planet Kepler-1625b? Durch Beobachtungen mit dem Weltraumteleskop Hubble haben Astronomen erstmals stichhaltige Indizien für die Existenz eines Mondes um einen extrasolaren Planeten gefunden. Der Exomond kreist um den Planeten Kepler-1625b, der rund 8000 Lichtjahre von der Erde entfernt ist. Der Mond ist größer als alle Monde, die man in unserem Sonnensystem kennt. Scanning the sky for X-ray sources, ESA’s XMM-Newton X-ray observatory has been busy with the XXL Survey, its largest observational programme to date. The second batch of data from the survey has just been released, including information on 365 galaxy clusters, which trace the large-scale structure of the Universe and its evolution through time, and on 26 000 active galactic nuclei (AGN). Astronomers using ESA’s XMM-Newton space observatory have captured the X-ray glow (shown here in purple) emitted by the hot gas that pervades the galaxy cluster XLSSC006. Der Favorit von US-Präsident Trump fiel zunächst mit zweifelhaften Aussagen zum Klimawandel auf. Seit April führt Jim Bridenstine nun die US-Weltraumbehörde Nasa. Wie tickt der Mann? Der Administrator der US-Luft- und Raumfahrtbehörde NASA, Jim Bridenstine, hat erstmals das Kosmonautenausbildungszentrum (ZPK) Juri Gagarin im Sternenstädtchen bei Moskau und den Roten Platz in der russischen Hauptstadt besucht. Der Chef der US-Luft- und Raumfahrtbehörde NASA, Jim Bridenstine, wirbt um die Teilnahme Russlands am amerikanischen Programm zur Errichtung einer Raumstation, die den Mond umkreist. Er möchte, dass sich die GK Roskosmos dem Projekt anschließt, sagte Bridenstine am Dienstag in einem Vortrag an der Moskauer Lomonossow-Universität. NASA has provided an update on the continuing investigation into a small air leak aboard the orbiting laboratory that astronauts patched on Aug. 30. SpaceX’s first uncrewed test flight of its Dragon capsule for astronauts has slipped to no earlier than January 2019 on account of the International Space Station’s docking schedule, NASA announced today (Oct. 4). The Chinese space program is speeding up and closing the gap with the US inch by inch. But now it’s getting even faster as a government official in charge of the program announced on Monday that the Chang’e-6 moon lander, which is two generations ahead of the current Chang’e-4, will be so large that it can provide 10 kilograms of weight for foreign payloads. The two super elements of the James Webb Space Telescope successfully communicated for the first time. The test was completed by Northrop Grumman Corporation (NYSE: NOC), in partnership with NASA, and demonstrated operability of the electrical interfaces between the Optical Telescope element/Integrated Science instrument module (OTIS) and Spacecraft Element (SCE). SpaceX successfully launched the SAOCOM-1A satellite and landed its Falcon 9 booster on a new landing pad at California’s Vandenberg Air Force Base, the first-ever West Coast landing for the rocket. Das US-Unternehmen SpaceX hat in der Nacht zum Montag erfolgreich einen argentinischen Radarsatelliten gestartet. It was a night sky sight so dazzling, the mayor of Los Angeles told everyone not to worry about aliens: a SpaceX Falcon 9 rocket streaking into the evening sky, leaving a brilliant glowing plume in its wake. Mehrere russische Raumfahrtunternehmen haben dem Staatskonzern GK Roskosmos ihre Vorschläge für mehrfach verwendbare Trägerraketen unterbreitet. Dabei handelt es sich um die Raketenzentren Chrunitschew, Progress und Makejew, wie Moskauer Medien unter Berufung auf die Behörde für Staatsaufträge berichten. 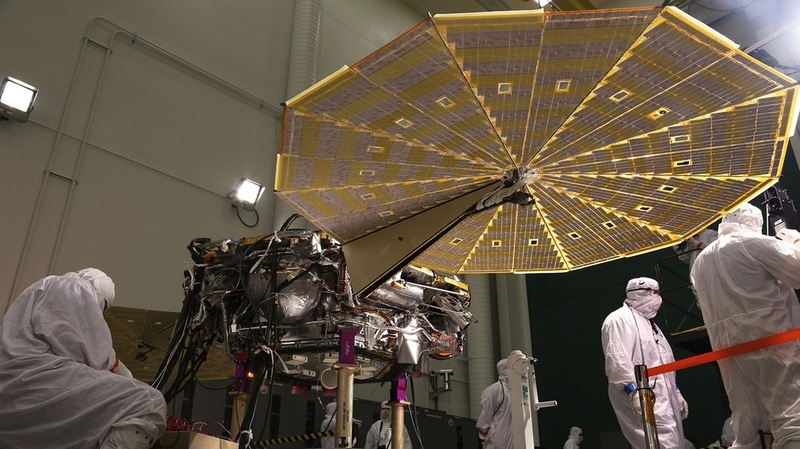 What does NASA do to get a rover ready for Mars? JPL’s paint shop does a thousand different paint jobs a year. And while every piece of spacecraft that comes through the shop is important, one headed for the Red Planet adds a little extra oomph. Video Credit: NASA/JPL-Caltech. Download video and caption. Watch an Astronaut Rock Out with The Tragically Hip from Space! 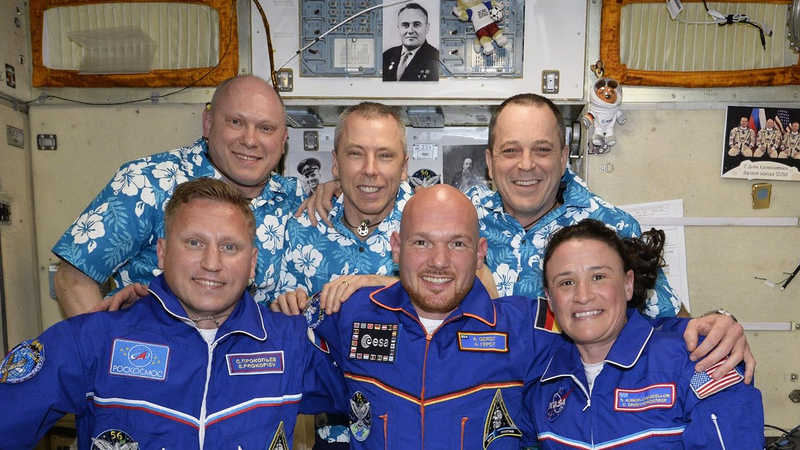 Just days before an epic return from space, Expedition 56 commander Drew Feustel recorded a music video on the International Space Station celebrating the ways that people can connect on Earth. Helping him was the lead bassist from the Canadian troubadour band The Tragically Hip. The Saturn V rocket and its predecessors soar toward open space in the first of three new posters by Space.com celebrating landmark anniversaries in space history. When it comes to colonizing Mars, transporting astronauts and keeping them alive might seem like the biggest hurdles today. But that’s only the beginning — as the population of Mars continues to grow, so will the scope of the colonists‘ problems. China’s plan to launch and construct a space station could be hit by a test flight delay of the launcher designed to send the modules into orbit. An online report by People’s Liberation Army Daily, a military newspaper, reports Lin Xiqiang, deputy director of the China Manned Space Engineering Office (CMSEO), as saying at a press conference in Beijing on Wednesday that the Long March 5B will not make its planned test launch in the first half of 2019. Rick Searfoss, a former NASA astronaut who launched on three space shuttle missions before serving as a test pilot for a commercial rocket plane, has died. He was 62. Erforsche das Klima der Erde und des Mondes – mit zwei neuen ESA-Schulprojekten! Mit großer Freude stellt die ESA pünktlich zu Beginn der Internationalen Weltraumwoche zwei neue Schulprojekte vor: das Mond-Camp und die Klimadetektive. Die Projekte wurden für Schülerteams unter Anleitung eines Lehrers oder Erziehers entworfen. Die Idee hinter dem Mond-Camp und den Schülerdetektiven: Jungen Menschen die Möglichkeit zu geben, interdisziplinäre Projekte durchzuführen und dabei neue Fähigkeiten in den Bereichen Wissenschaft, Technologie, aber auch Teamarbeit und Kommunikation zu entwickeln – und dabei genauso zu arbeiten wie echte Weltraumexperten. Deep-space missions, to Mars and beyond, could spell trouble for astronauts, according to new research showing that cosmic radiation can damage the digestive tract, stomach and colon. Apollo 17 took 12 people to the surface of the moon and marked the end of the Apollo program. By the time the mission launched, on Dec. 7, 1972, public interest in space exploration had declined and the government had shifted focus to the Vietnam War. These and many other factors brought the program to a close, even though three more flights were originally planned. 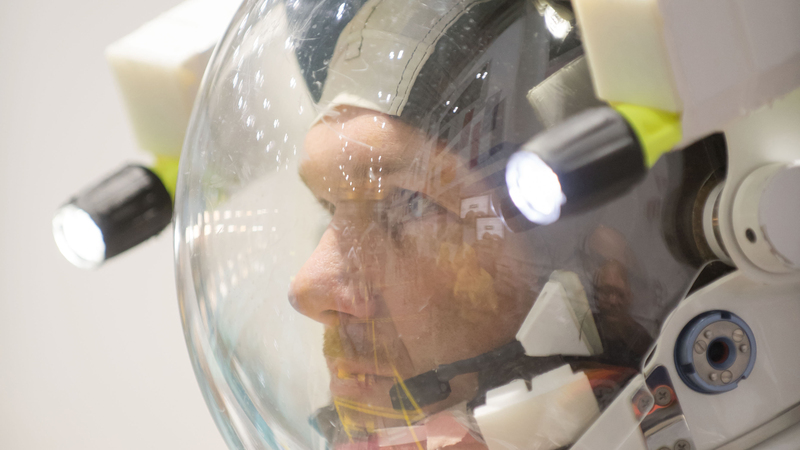 Dieser Eintrag wurde unter Newsletter, Raumfahrt, Spacecraft Mission News veröffentlicht und mit Alexander Gerst, Astro_Alex, BepiColombo, Hubble, International Space Station, Internationale Raumstation, ISS, Mars, NASA, NASA InSight, Newsletter, Sojuz, Soyuz, Space Station Leak, Spacecraft Mission News verschlagwortet. Lesezeichen für Permalink hinzufügen.